As I read through the blogs that are posted on this website, it is very clear to me how lucky we all are to be in such an amazing profession. Working with students and doing good for others is a wonderful aspect of our lives. But sometimes the times are tough. We work so closely with others, especially the students we work with, when tragedy strikes, it can really take a toll on us both professionally and personally. This was especially true for those in southern New Mexico on November 16th, 2012. One of our most involved and active students, Emily Lein, passed away from natural causes in the residence halls. 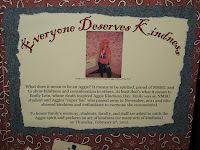 Emily was a student each of us had interacted with or knew about her through a friend. She showed up at each event and was always willing to help with whatever needed to be done, and the one who would talk to every single person around her. Because each Resident Director, Community Assistant, and many of the residents knew at least who Emily was, this death hit our community pretty hard. While the Resident Directors were the ones who grieved the most, , we had to be the support for those around us- both our residents and our own staffs. There was a beautiful candlelight vigil for Emily that the cheerleaders organized for their “biggest cheerleader, Emily.” One thing that was repeated throughout the comments that night was that Emily always seemed to “weird people out,” or “would get on my nerves, mainly because she was so happy, had so much energy, was all over the place,” and people wish they had been more kind to others or given Emily more of a chance. While it was sad to hear that it took one’s death for people to realize they needed and wanted to be more kind, it was eye opening to many of the students at the vigil to simply be nicer to others. Nicer in our daily interactions and nicer in our verbal communication, along with non-verbal communications. The world is a lot better of a place when we are able to slap a smile on our face and spread happiness to others. Well, the Fall semester continued, and Thanksgiving came and went. Finals were taken, the residence halls were closed, and eventually a new year started. After everything was under way for Spring semester, an amazing woman and coworker of mine, Michelle Bernstein, organized Aggie Kindness Day, which intended to be a day of random acts of kindness for those in the community. 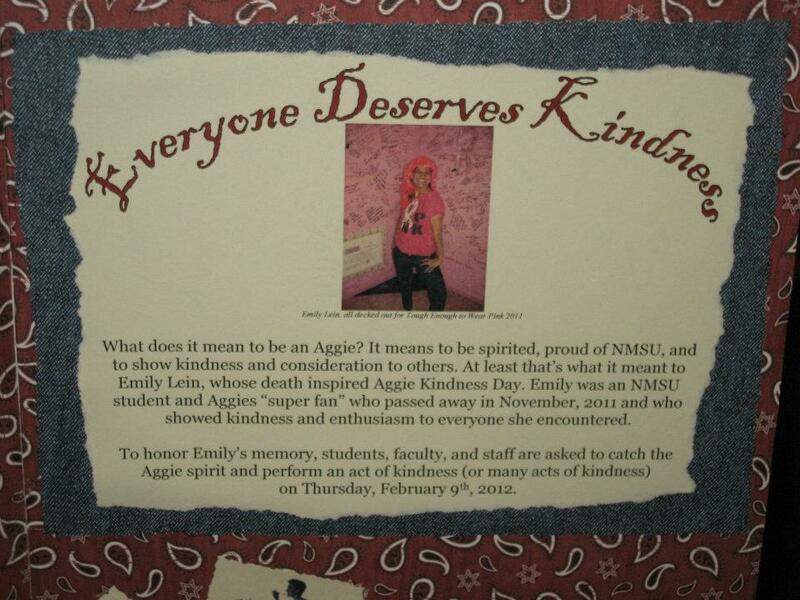 This day was all in memory of Emily, who only wanted to share kindness with everyone, no matter how they may have treated her. 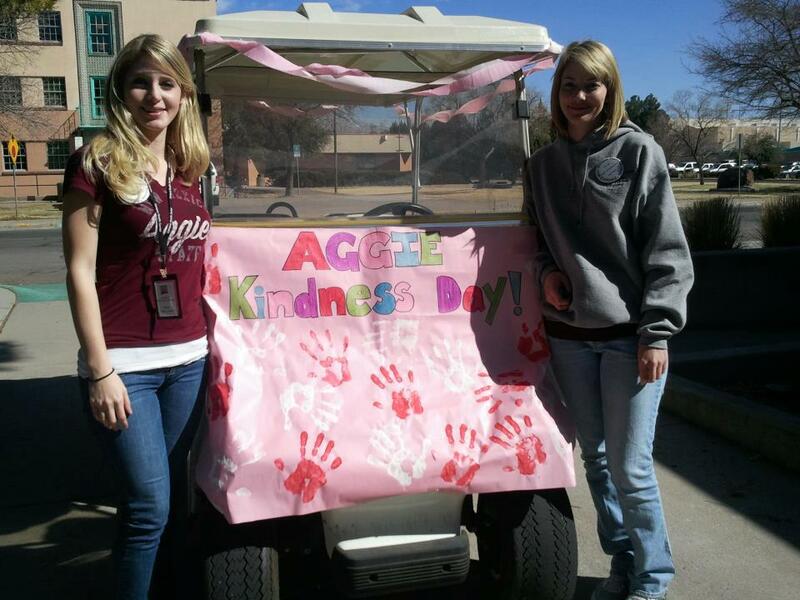 Michelle, with some help from other departments, coordinated a campus wide Aggie Kindness Day campaign, and tabled for a week around campus to promote it. Those who promised to participate signed their names and received a button showing their dedication to acts of kindness. It was an amazing thing to see students all over campus wearing these buttons the whole week, leading up to Aggie Kindness Day on Thursday, February 9, 2012. Whatever act of kindness you may do today, whether small or large, conscious or subconscious, I thank you. I know Emily would thank you as well. Seeing how much difference it made on a campus (that is usually pretty private in one’s actions) opened my eyes to more than I thought possible. 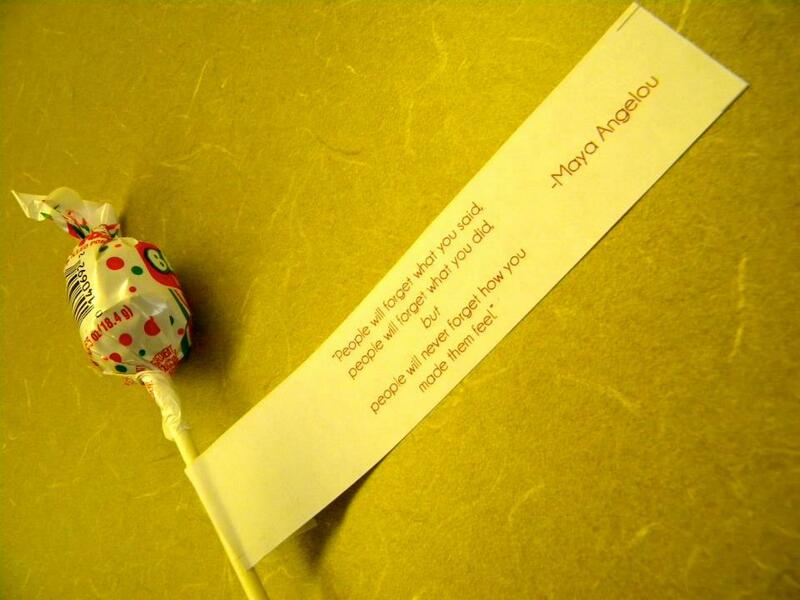 Imagine what it could do if we each did a random act of kindness each day.